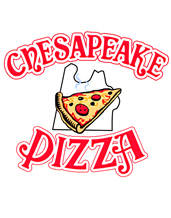 "Award Winning Stone-Baked Pan Pizzas Since 1973"
Welcome to Chesapeake Pizza. Established in 1973, we are a full service, family oriented pizza restaurant. We truly believe in providing the best; hence, we do not compromise on the quality and value of what we offer to each of our customers….and all of our hard work & dedication pays off through numerous awards and recognition we have received throughout the years via “The Virginian Pilot”, “The AltDaily”, and “Hampton Roads TV”. So please join us….and taste for yourself! !